Happy Friday everyone. After my post last week, I was in touch with several vendors about what was occurring, my thoughts and how they intended to fix the problem when it comes to accessing the backup file data. Since then, two vendors (Cellebrite and Elcomsoft) reached out with an updated solution. I tested these tools over the last two days and want to share my results. I used Cellebrite Physical Analyzer v 5.3.5.10 (soon to be released), Elcomsoft v6.10 and iTunes 12.5.1 as well as the previous iTunes version to be thorough. What changed since the last blog? First, if an iOS10 backup file was encrypted with iTunes, you do not need to assume you cannot get into that data. (This was the case in my previous blog. Even if the password was known, the tools were choking on the data). If you can crack the password, Cellebrite’s UFED Physical Analyzer will properly decrypt this data. I bet you are now wondering how I cracked the encrypted iOS 10 backup files? I used Elcomsoft Phone Breaker v 6.10. I set three different passwords to test. The first was 0000 and Elcomsoft laughed at this and provided the password before I could even sit back in my chair to watch. 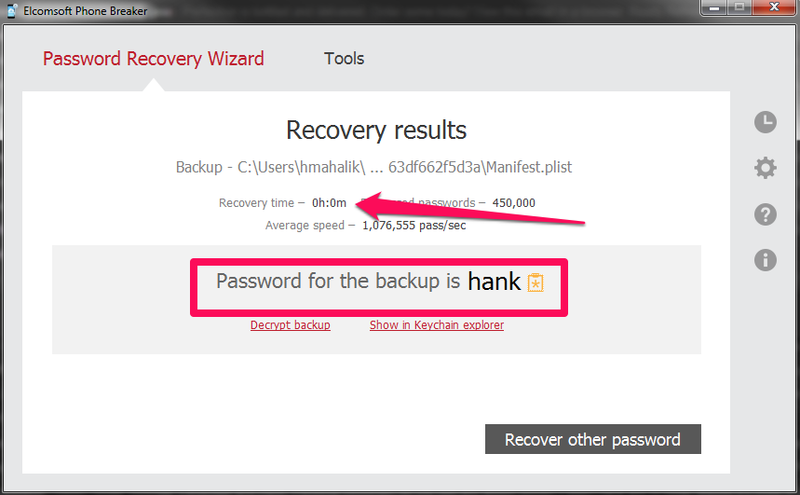 I then updated iTunes and changed my password to “hank” – this password didn’t even take a full second to crack. Maybe their claims are true that they will crack a passcode the fastest due to a vulnerability they found in the hashing of the passcode. I then set a more difficult password “Heather1” and backed up my data using iTunes. Elcomsoft is saying that there is 87 years remaining for a brute force attack, so I am not going to wait. What should you do here? Try a dictionary attack! 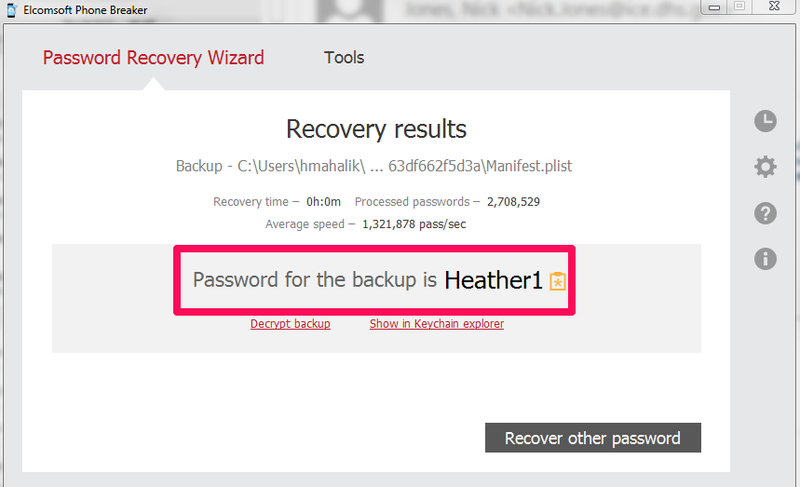 It’s much more effective with passwords such as “Heather1” when compared to Brute Force. When I changed to dictionary attack, this password was crack in less than 1 second! As a side note, I relied on the English dictionary and did not create anything custom for this test. So, we have the password, what about the encrypted databases? I was able to successfully parse all of the iOS10 backup files that I created over the last two days, containing various backup passwords, as well as the ones that were created for my previous blog post. As long as Physical Analyzer had the password, the data was decrypted and parsed. Make sure you are using Physical Analyzer v5.3.5.10 or later (assuming you have tested and validated the latest versions). 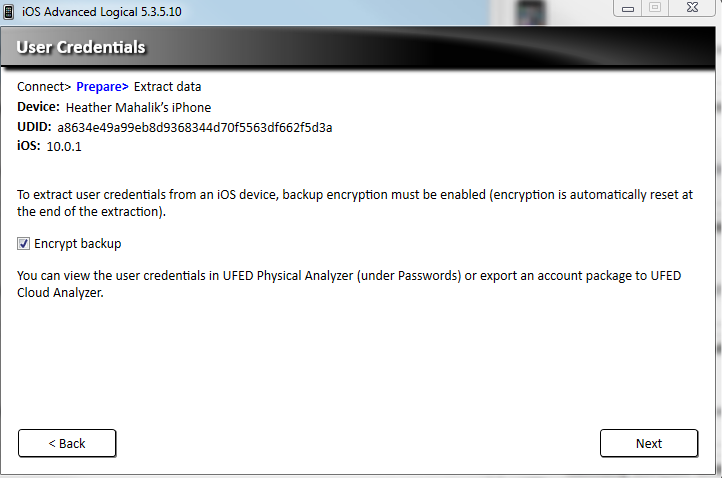 When attempting an Advanced Logical in Physical Analyzer, the option to encrypt the backup is provided if the backup has not been encrypted via iTunes by the user. You should select this option. If not, you will not get the data protected by the keychain. I selected to Encrypt my backup as shown below. As stated in my last post, this was not an option with iOS10. Cellebrite has fixed this issue and all of the data will be parsed and decrypted. Additionally, if you are prompted for the users iTunes backup file password (the one you cracked with Elcomsoft), Physical Analyzer will parse the data when the password is correctly entered whether you selected an Advanced Logical Extraction or to add an iTunes backup file into the tool for analysis. 4. I reset the passcode in iTunes and then selected Advanced Logical Extraction. I was prompted for the user’s backup password. Not only did it parse the databases, they are decrypted. These databases can be exported and put into other tools for parsing, merging and interpreting the data – something like Paul Sanderson’s SQLite Forensic Browser. Below is a sample of my call history database. When we take the tools out of the equation, which is required to determine how the data got onto the phone, this process gets much harder. 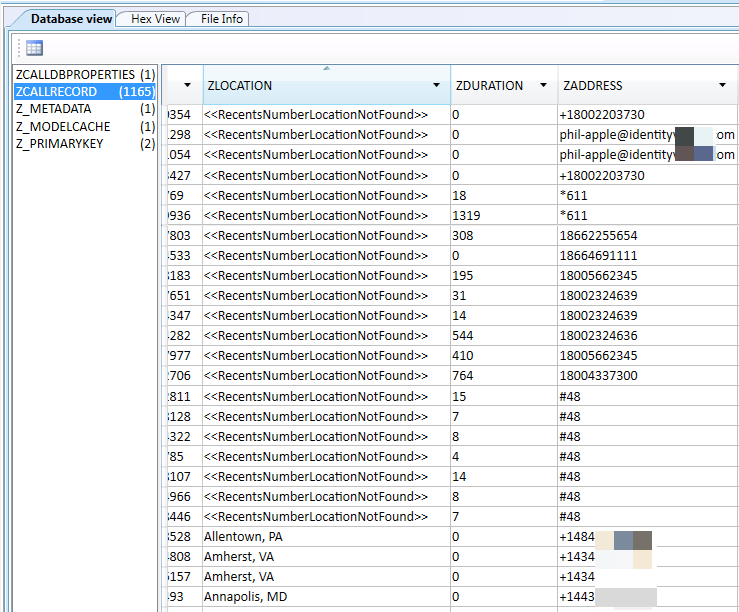 Below, you can see what Physical Analyzer is reporting for my location information. If you have heard my and Sarah Edwards endless presentation on location information, you are already aware that these iOS devices track a lot that we do and also track other things people do for us! What does that mean? If a friend tags you in a social media post, this data can show up on your device as a location you have visited – even if you haven’t been there. Why? Because you or something gave that app or browser permission to do this. What does this look like? In this example, I can tell you what is true and what is not. How – it’s my phone! If it weren’t, I better be prepared to manually look at databases and artifacts to piece this information back together. For example, that Facebook location is the lat/long for one of my friends on chat. I was not at that location. Mail Content, iPhone RecentLog, Map Searches, Map Suggestions and more all need to be verified by an examiner. The tool cannot do this for you. The tool also cannot pull location information from 3rd party applications that they do not parse. 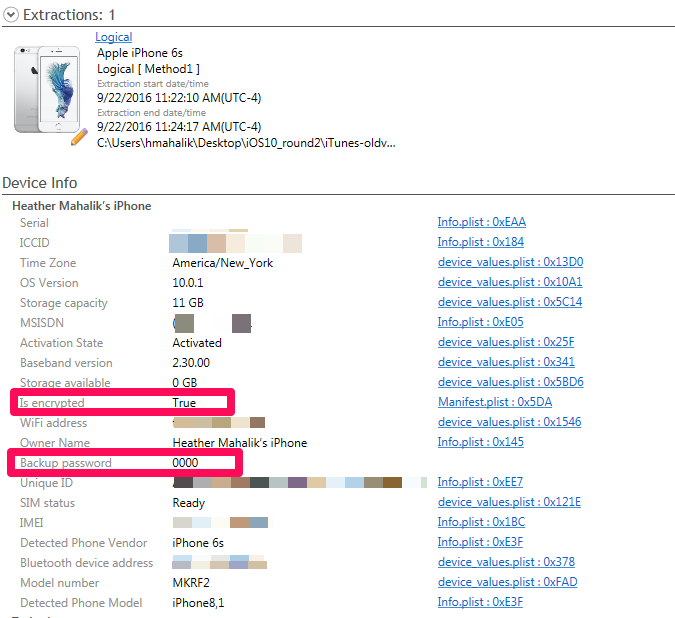 Need to learn proper examination techniques – take FOR585 Advanced Smartphone Forensics. We teach you how to stand behind the evidence you put in your report. Your tool can only get you so far. My concern in my first blog was that our tool couldn’t even get us beyond the first hurdle. Now that they have, are you prepared to defend your report or what the tool is telling you? Remember, these tools parse everything that is on the phone. It’s your job to determine how the data got there. Previous PostA glimpse of iOS 10 from a smartphone forensic perspectiveNext PostHow the Grinch stole Apple Maps artifacts… or did he just hide them? Yes! It all depends on the device, but you can also crack the pattern and take it from there. In my line of work many times the client can provide me with passwords for the devices in my lab, but quite often they don’t remember enabling or setting the itunes backup encryption password. After many brainstorming sessions of older passwords it is typically an older apple ID password or sometimes even the windows logon password at the time they first installed itunes that was used for the backup encryption. There are many threads in the support section of apple.com with frustrated users who can’t un-encrypt their own backups. I have a license for elcomsoft phone breaker specifically for getting around this issue, and I have to use it quite often. Can you please help me with my encrypted backup? I have tried many tactics already.